Tumblr is a great microblogging platform for folks who want to get up and running with minimum hassle. The feature set is constantly improving and there are already a number of good themes available. However, when I was searching for a minimalist-style theme, I couldn’t find one I was particularly happy with. I decided to create to my own free minimal Tumblr theme, inspired loosely by the great Modernist Massimo Vignelli, and the style of my own blog. 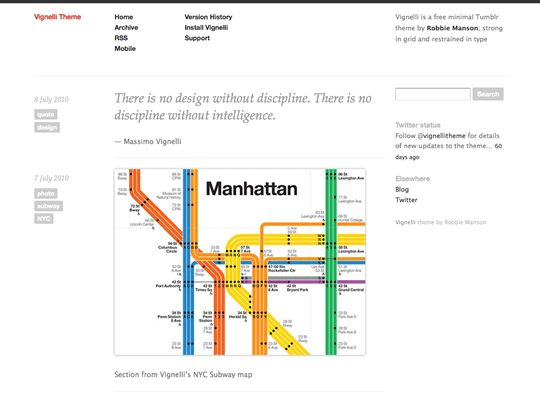 Note: Vignelli is a completely free theme, and as such I don’t offer technical support. The official custom Tumblr theme documentation contains plenty of guidance. To customise these colours, click ‘Customize’ from the site menu in your Dashboard, then ‘Appearance’ from the menu bar. To show your latest Twitter status and links to other accounts you have on the web, simply add your own usernames under the ‘Appearance’ menu on your Tumblr ‘Customization’ screen.